ICE 2015: Organize Your Life with Chrome Extensions! Today, I am presenting along with Amy Heavin at the ICE Conference located at Noblesville High School! Click Here to Access our presentation! Click here to see last year's presentations! Welcome to the "Nerd Herd!" At MSD of Steuben County, we believe in recognizing our colleagues who are trying new and exciting things in their classrooms! Consider nominating one of your fellow colleagues for an honorary induction into the "MSDSC Nerd Herd!" Click Here to view Mr. Yoder's post on how to participate! Can't wait to see who will be nominated into our October Nerd Herd! New Post: "Our 2015 Journey Into Blended Learning!" New Post: "Using Staff Feedback As Fuel To Drive Our Future!" Matt Miller (Author of "Ditch That Textbook") Created A Page of Resources on His Website Specifically for MSD Teachers! Click Here to Review "Why Recording Our Teaching is Valuable!" Click Here to Review "Screencastify Tutorials" for Teachers! Click Here to Review "How to Distribute Video Content To Students!" Our Original "Stakeholder Feedback Journey"
Our 2015 Journey into Blended Learning! In addition to embracing Matt's inspiring message, our goal as a district was to have teachers walking away with concrete ideas on how to blend video and technology into their teaching. Also, we wanted them to leave having practiced the skills of screencasting, and having had meaningful dialogue with colleagues about how to thoughtfully incorporate these strategies into pedagogy in order to personalize learning for our students! 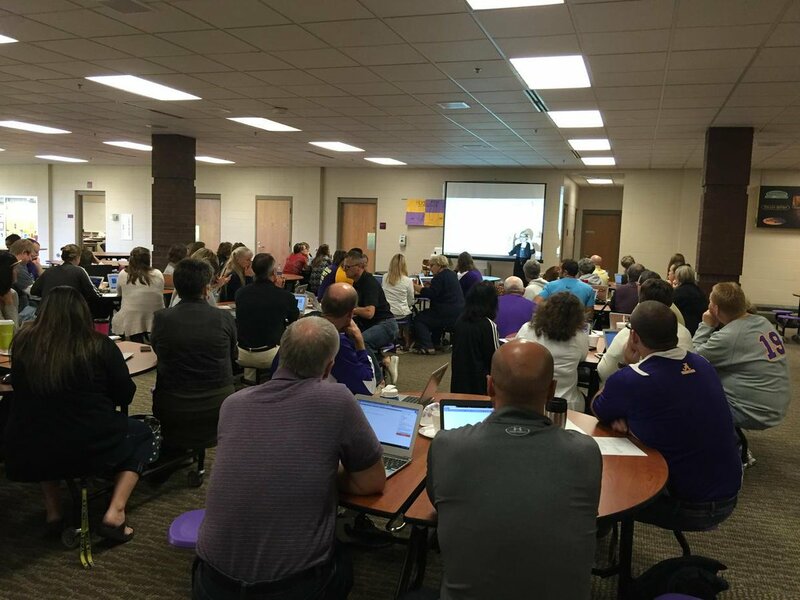 During the morning, we encouraged teachers to start small, and to think of one or two ways in which they can incorporate the Blended Learning philosophy into their teaching this school year. We modeled authentic examples of how to digitize and screencast substitute teaching lesson plans, how to duplicate yourself by screencasting short how-to videos for students, how to empower your students to create homework how-to videos for other students, and how to begin challenging our students to create and publish online digital products for authentic audiences! Overall, it was a fabulous day, and we are very proud of our teachers, their level of dedication, and their willingness to have meaningful conversations and dialogue regarding how to take our teaching to the next level with technology integration! What will YOUR 2015-2016 #MSDSafari Be? Summer Projects & Student Devices! Chromebooks ready for Students in Grades 3-5! We will post more updates of our Summer Journey soon! Also, we are going to be pushing our iPads down to Grades K,1,2! Looking forward to an exciting 2015-2016 School Year! on America's Parks, Landmarks, and Monuments! Mr. Lantz and Mr. Moore! We have 3 Teachers at MSD who have been Blogging for Indiana Digital Learning Month? Check out their amazing 28 Day Web 2.0 Challenge Blog Posts! "5 Paragraph Response to Reading!" Projects! Check out Mr. Curtis' 4th Grade Student Projects! "5 Paragraph Response to Reading!"